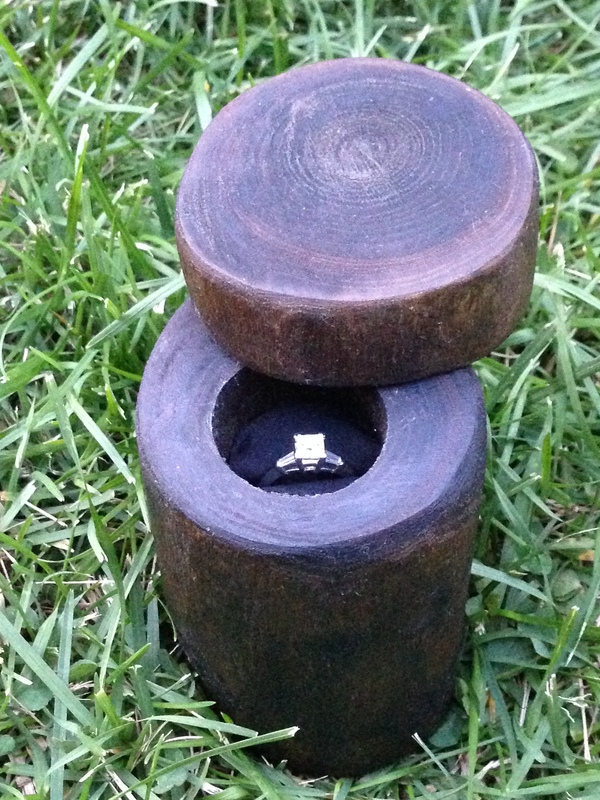 When John proposed to me this summer, he presented the engagement ring in this wooden ring box. 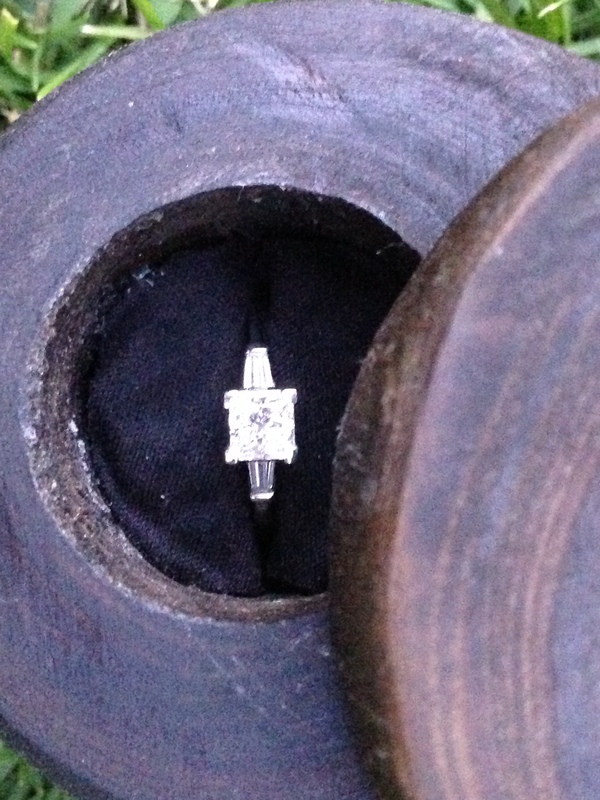 I instantly loved the ring box and was even more blown away when I learned that he made it himself. So I asked him to share the DIY instructions on Cooking with Alison’s first guest post. Don’t worry if you don’t own any tools, because John doesn’t either. He shares below how he was able to get access to tools and woodworking help for very little money. The inspiration for making a wooden ring box came to me while I was planning my proposal. I wanted the proposal to be low-key and sentimental with some sort of unexpected component. I knew that Alison loves the process of making things from scratch, as evident on this blog, so I came up with the idea of using something handmade for the proposal. I focused on woodworking projects, because Alison loves reclaimed wood and restored wooden furniture. 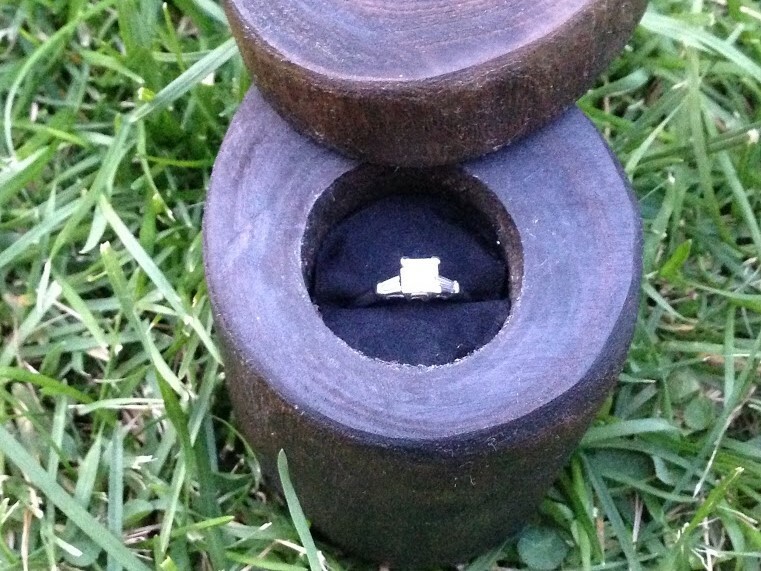 Through a Google search, I found a few wooden proposal ring boxes, but this one caught my eye where someone made a ring box out of a tree branch. I really liked it, because it looked really natural and earthly, and the lid swiveled open to reveal a hidden ring. The article had good pictures, but it didn’t include step by step instructions on how to make it. So, I went back on Google and found The Shop, a local woodworking and metal shop that allows people to use their equipment for a nominal fee. The Shop also offers regular classes on various DIY projects. I went to see the facilities and met the shop owners, Michelle and Marissa. They were very friendly, accommodating, and incredibly helpful when explaining to me the steps and tools that I would need to make my ring box. Luckily for me, this project only requires a beginner’s level in woodworking. Wood Log: I used a wood log/branch of about 5 cm in diameter. I got the tree branch for free by searching kijiji.ca for people that were giving away free firewood within my neighbourhood. 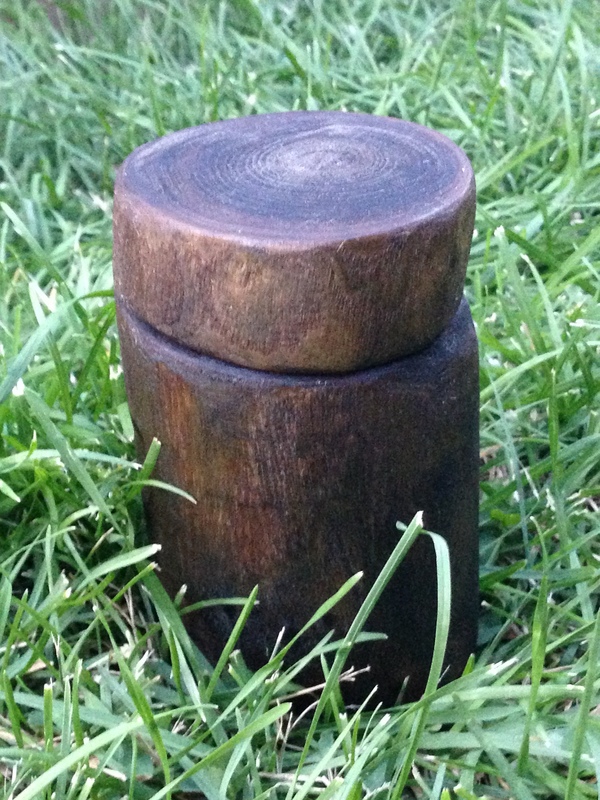 I had tried to look for dead wood branches, but felt that the wood was too brittle to make into a ring box. I recommend using a soft wood like cedar or spruce to make it easier to cut. I also recommend finding wood that hasn’t fallen off the tree for too long, or else it could splinter and shatter when cut. You might want to choose two or three logs/branches to work with, in case something goes wrong when you’re cutting one of them. Wood Dowel Pin: The next step is finding a wood dowel pin, which is a small wood piece that is typically used to connect furniture parts. I got mine for free from Ikea. They have bins of free dowels and spare parts. Ring Holder: You may simply place the ring in the hole inside the base of the ring box. But if you would like the ring to be able to stand upright in the ring box, you will need to make a ring holder for the base of the ring box. To do this, you will need white glue, foam (I cut out pieces of foam from an old ring box), and felt (I used black coloured lens cleaning cloth). I don’t own any wood working tools, so I found a woodworking shop in my city that would allow me to use their equipment for a nominal fee. The people at The Shop were incredibly nice and helpful. Be sure to check out their classes! Miter Saw: For cutting the wood log into different sections, I recommend the Miter Saw, which gave the easiest way to cut through the thick log and bark. Thankfully, the staff at The Shop showed me how to use it and helped me with the setup. They did not recommend using the electric band saw. Drill Press: For drilling holes for the ring and for the dowel, I recommend using a drill press. Sandpaper: You will need medium to fine grit sandpaper (P60). Do not use sandpaper from the dollar store, as it will not be strong enough for this project. Wood Chisel and Hammer: This is optional and is only required if you want to strip the bark off of the log. First step is to choose the portion of the log that you want to use for your ring box. 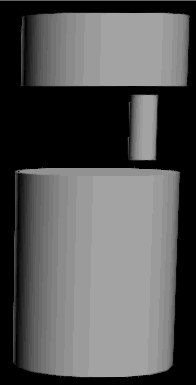 Find the smoothest and most cylindrical section. The section that I chose to cut out and use for my ring box was about 10 cm in length and 8 cm in diameter. Cut off the ends of the log and discard the pieces that you won’t be using. Make the cuts crosswise and as perpendicular to the length of the log as possible. 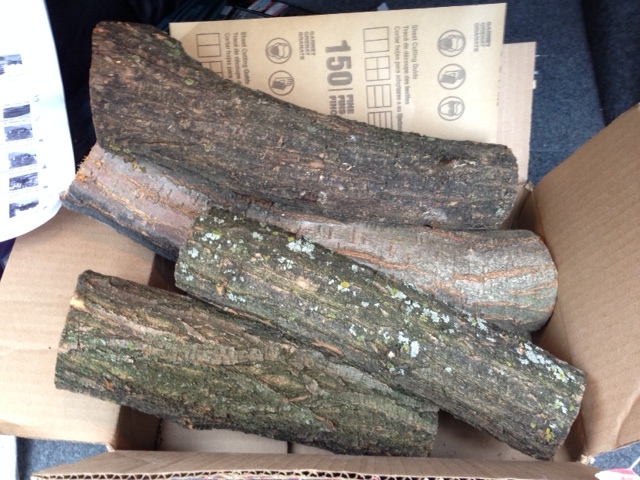 It is a good idea to start with 2 or 3 logs, so you can choose the best piece after you’ve made all of the cuts. Then cut your piece of choice into two smaller pieces crosswise, one for the lid and one for the base of the ring box. 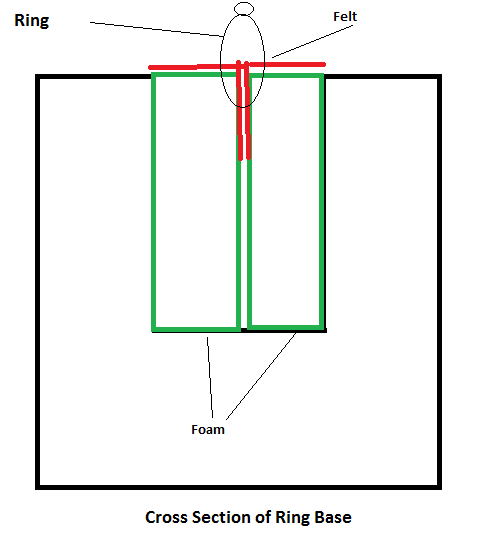 You should make sure the lid and the base align well together (see diagram). The next step is to drill a hole in the base where the ring will be placed. It should be approximately 3 cm in diameter and around 3 cm deep, with enough space to fit the ring into. The hole should not be perfectly centered in the base and should allow room for the dowel to be inserted above the hole (see diagram). Once that is complete, you need to drill a hole into the base and a corresponding hole into the bottom of the lid so that the two pieces can be connected by the dowel. To measure how big of a hole you will need, I recommend placing the tip of the dowel on the base and drawing an outline of it with a pencil. You should then find a drill bit that is slightly smaller than the diameter of the dowel. To get the holes aligned between the lid and the base, you can apply a dab of glue to the location of the dowel on the base of the ring box, and then place the lid onto the base. When you lift the lid off of the base, you will see a dab of glue on the lid in the spot that you need to drill a hole. Drill the two holes. You should how have 3 components to the ring box. The base, the lid and the dowel that will be used to connect the two. Sanding is optional as you may want to keep the bark on the log for a more natural look. Use a wood chisel and hammer to gently strip off the bark from the log. If the wood is still wet because it is a fresh log, wait for the log to dry before starting to sand it. Below is the result after removing the bark. Sand with a medium to fine grit sandpaper (P60) to smooth out the edges around the sides of the lid and the base. Make sure to sand with the lid on the base so that the edges of both pieces are flush. The method I used for staining the wooden ring box was tea staining. I found the instructions on Instructables. Find a piece of steel wool used for dish washing and submerge it in a glass container of vinegar. I recommend submerging for at least a day. Brew some black tea and steep the leaves for one hour. Let it cool completely. Brush the tea onto the wood, ensuring you cover all areas. Let the wood dry. Brush with the vinegar and steel wool solution. The tannins in the tea will react with the vinegar and make the wood darken. You may need to repeat this procedure if you wish to darken the wood further. If you wish to have the ring standing upright when you present it, you will need to make a ring holder inside of the base. Cut out one small piece of foam in a square shape that fits into the hole. It should fit snug into the hole so that the foam pushes against the sides of the hole. The height of the foam should reach about half of the depth of the hole. Cut the piece of foam in half. You will be inserting the two pieces of foam into the ring box so that there is a gap between them that run straights down the middle of the hole, height wise. Apply glue on three sides of the foam, lengthwise, so that it sticks to the sides of the inside of the hole. The piece of foam should fill one half of the hole, lengthwise, not crosswise. Repeat with the other piece of foam to fill up the other half of the hole. Wait for the glue to dry. Place the lid onto the the ring box by inserting the dowel from the base into the hole found on the underside of the lid. You will be able to swivel the lid around to reveal the hidden ring holder. Then insert the ring and admire your work. congratulations, what a beautiful keepsake for a memorable occasion.